Paula’s Choice reviews are FAKE! 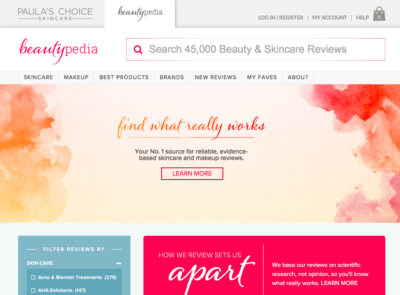 “Beautypedia” of Paula’s Choice, a safe place were you can check reviews of numerous skincare brands, to bad the reviews of Paula Begoun are FAKE! In this exclusive article we will EXPOSE Paula Begoun. Yes, Paula’s Choice reviews are fake, that’s not an opinion that’s a fact. An Australian skincare company has approached me to have a closer look at Paula’s Choice. So we have done a big investigation regarding this company, who claims to have done thousands of reviews on skincare products. Paula Begoun, also known as “The Cosmetics Cop”, is an American businesswoman, author and Radio-host. She has done numerous of TV-appearances on extremely populair shows such as Oprah. Paula Begoun is also the founder of Paula’s Choice and Beginning Press Publishing. She is known for her view that skin care and cosmetics should be based on ingredients that have been subjected to peer reviewed research. Time for BestAnti-Aging.com to investigate Paulas Choice. First let’s take a closer look at the products her “team experts”, which by the way aren’t really experts (more later), rate “poor”. It’s a very big coincidence that the “poor rated” products are super populair, is she afraid of competition? The answer is YES, she wants you to only buy her products. When a product is being bashed by her team it’s mainly because the ingredients are bad an dangerous, at least that’s what she wants you to believe. But most of the time the ingredients aren’t that bad as she claims. Some of her products are full of cheap fillers and a extremely high concentration cheap silicons. The ingredients she uses makes your skin feel soft, but it’s comparable with the ingredients used in a conditioner. Makes your hair feel soft, but it is bad for your skin. Why does an expert that has written many books about skincare sells crap? There are 3 reasons for her to do so; 1) money, 2) money, 3) money. Her products aren’t expensive, but her overhead costs are big. So cheap ingredients is the way to go. Always do your own investigation buying any (skincare) product. Shame on you Paula, for misleading customers with fake reviews! Not only are they fake reviews but the products are filled with chemicals that are bad for your skin. There are better products that cost less than 1/2 of what her junk cost. Thank you for writing this article. I have know for years that she stacks the deck against any other product line. Her products, as you mentioned, has tons of chemicals and junk that will ruin your skin. The ingredients labels are a mile long. Not good! I have contacted Paula’s choice via email and told them just that. I received a canned reply about their bogus research. Feel free to send us the email you have received, we are talking to BIG TV-Channel to expose her fake reviews.